(due to clouds) when I was at Angkor Wat; briefly 'losing' my wallet. Smells: Incense; food aromas (some pleasant, some not so pleasant). Sounds: "Lady. Want a tuk tuk? "; "lay-deeeeeeeeee"; little kiddies saying "Hello!" as you walk by. 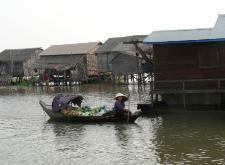 the dirt off; homes on stilts in the middle of the water; naked kids bathing in the brown water. mango and dried fish salad. 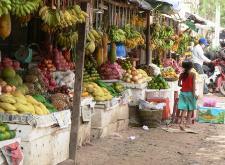 Street Food: Fruit; cut and seasoned fruits and veggies; cut sugar cane; skewered fish balls. Fun Food Finds: Diet A&W Cream Soda; Diet Dr. Pepper; Pepperidge Farm cookies; Kettle chips. Western Companies Out Here: Dairy Queen. dollars everywhere out here so there is no need to get the local currency. 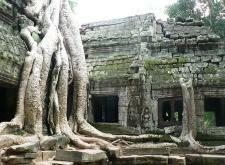 The jungle overtaking a temple.